Bake or microwave 4-6 medium sized potatoes. Combine the mince mixture with the flesh of each potato, reserving the cooked skin. 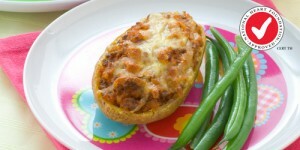 Fill the potato shells with the mince and potato mixture. Sprinkle with grated cheese and serve with your favourite vegetables.